We first met the folks from Vita Bone® at the BlogPaws Conference in 2015. Each year since then we've enjoyed visiting their booth at the conference and seeing what new treats for dogs they have. 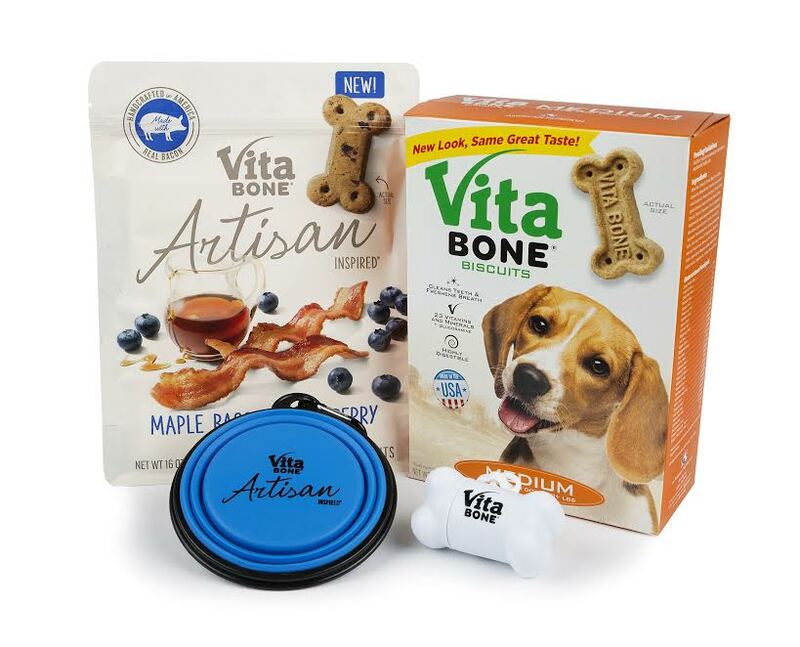 This year Vita Bone® has introduced some new Artisan Inspired® soft dog treats. I love the healthy ingredients and the artisan inspired style of these treat flavors. In addition to their Dog Biscuits and Chewys, these new Artisan Inspired® treats are SOFT dog treats. I think the soft treats are a great addition to their line of dog biscuits and other snacks for dogs. ➤ Real Meats, like Turkey, Chicken, and Bacon! Enough TALK, when are we gonna EAT them!? Vita Bone® Artisan Inspired® Treats are thoughtfully crafted in five kitchen inspired flavors. They're great as an everyday reward, training treats, or a special treat for your dog just 'cause you love each other so much! Enter our GIVEAWAY below to win a Prize Package of dog treats from Vita Bone! This post is sponsored by Vita Bone®. I am being compensated to help share information about Vita Bone® Artisan Inspired® soft dog treats. We only share information about products we feel are relevant to our readers. 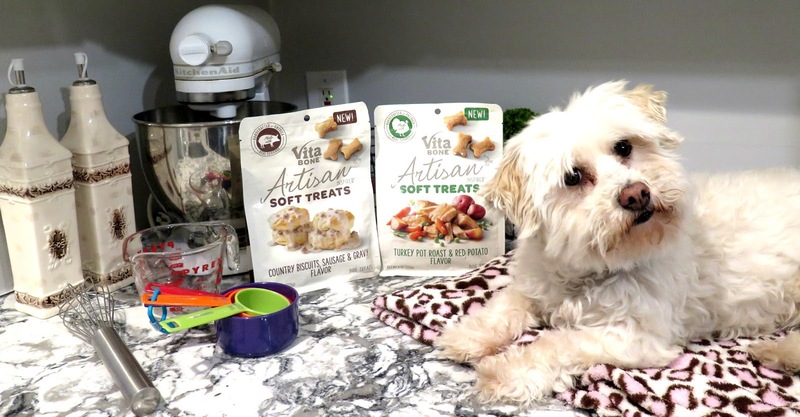 Vita Bone® Artisan Inspired® Soft Dog Treats are a hit! Icy and Phoebe give these treats a PAWS UP!! ENTER TO WIN A VITA BONE® PRIZE PACKAGE WITH THESE DELICIOUS TREATS FOR DOGS, A PORTABLE WATER BOWL, AND POOP BAGS WITH BAG HOLDER! Vita Bone® dog biscuits and treats for dogs are available nationally at Walmart and grocery stores. Use the Vita Bone store locator to find a store near you that carries Vita Bone products. Treat your dog and your wallet with these valuable Coupons for Vita Bone biscuits and chewy treats! Vita Bone is a family owned business that has been making dog treats in Utah since 1972. They are proud sponsors of the American Red Cross and Pet Partners. Both of these charities are near and dear to my heart. Icy and I are a Pet Partners Therapy Dog team, volunteering in our community to help people in need. I've been a supporter of the Red Cross for many years. They always seem to be the first ones to step in to help when a disaster strikes, anywhere in the world! I love companies that give back to their communities, like Vita Bone! FOLLOW VITA BONE ON SOCIAL MEDIA!! Vita Bone makes several different kinds of delicious dog treats, you can read about them here: Vita Bone's other delicious dog treats. These look so yummy! We entered because our doggie cousin would love these. Oh wonderful! That would be so nice of you to give them to your cousin. My dogs love these treats. We never turn away from any treat, crunchy or soft:) Those flavors sound so tasty. Thanks for the opportunity. Oh, good for you! Phoebe never says no to treats either, LOL! My dogs have tried several flavors and have loved them all. Thanks for entering the giveaway! My Babu is so picky with treats!Need to get the Vitabone Turkey stuffing and cranberry flavored treat and see if he likes it. Thanks for the recommendations! The Turkey Stuffing & Cranberry biscuits are delicious, both my dogs love those. They're a crunchy biscuit. They actually really smell like turkey & stuffing when you open the bag! Nice review. I can tell Icy and Phoebe like those yummy flavors. I actually liked to give my pets soft treats over the crunchy ones. I feel like our fur kids love them more. I also can appreciate a product with no soy or artificial junk. Thanks for sharing your thoughts. Thanks Kamira, I appreciate the kind words! They really did love the treats. I also like that they don't contain artificial flavors or soy. Those look like yummy treats. Kinda wish we were dogs so we could eat them. Kinda. ;) We like the fact that they are pretty healthy, too. LOL, I can't imagine you fabulous felines being anything else! They are yummy, my dogs really enjoy them. Those flavors sound good enough for me to consider eating one... LOL! LOL, I know what you mean Debbie! The turkey, stuffing & cranberry flavor treats actually smell like Thanksgiving in a bag! They smell so good I want to eat them myself too! The trend towards healthy food for our pets is unmistakeable and, also, important. Additives and perservatives have had their day and, as the market fills the healthy natural stuff will filter down to all budgets of dog food owners. These look gorgeous treats and, the acid test, they look good enough for ME to eat!! It is definitely the trend and I'm glad about that. Vita Bone treats are not expensive, which is so great. They're a very affordable national brand. I love that they have a lot of healthy stuff in them - if you think they LOOK good enough to eat yourself you should SMELL some of these treats, LOL! They'll make your mouth water. Me too! I love to spoil the pups with special treats, they deserve it. My dogs love these treats! I bet yours will too, give them a try. We love Vita Bone treats! Same here! I'm so glad they came out with a soft treat. Between the crunchy biscuits, the chewy's and now these soft treats they have a great line of dog treats. My dogs LOVE the chewy sticks too, OMD! They sure are! I hope you entered my giveaway for a chance to win some Lily & Edward. Those sound really yummy. We make our own treats and only sometimes we buy something such as dehydrated liver. It's good to see there are some good quality treats out there, though. They are super yummy, such great flavors & some really good ingredients in them. It's nice that you have the time and the ability to make your own dog treats. I do it occasionally, very simple treats but not too often. Phoebe is so cute, even when she's impatient! I'm sure my dogs would love these and since they are corn and soy free, even Nelly could have them! LOL, wasn't she hilarious in the video!? She nearly knocked the dish of treat out of my hand! They are great treats, I love the ingredients & flavors and my dogs love them all! They are SO yummy, & they have some really healthy ingredients in them! You must enter the giveaway and hopefully win some of these great treats. Thanks for sharing such a thorough review. We enjoyed meeting the friendly Vita Bone team at the BlogPaws conference, too. Happy to hear about the healthy ingredients in these treats! Thank you! I love seeing the Vita Bone folks at the conference each year, they are such nice people and SO passionate about pets. I like all these wonderful ingredients too! We have a photo of Mr. N with their mascot. He looks so tiny. Those flavors look good! I was disappointed that the Vita Bone Guy didn't attend this year's conference, but we loved seeing the Vita Bone ladies! The treats are delicious, Icy and Phoebe both love them. I had to laugh when I saw how delicately and gently Icy and Phoebe ate those treats off that plate because all I could think about was how Simon would have inhaled (literally, would have inhaled without chewing) the entire plate in one gulp! Those look delicious and we are always on the look out for soft chews! LOL!! Icy is always so gentle when taking treats, Phoebe not so much. She did almost knock the plate out of my hands in the video! They both love these treats. My dog basically gets treats whenever he wants. I'm a terrible trainer... Or he's a really good one. I think he might eat the soft Vitabones. He's very picky. LOL! I think your dog is very spoiled! Mama just can't resist spoiling him with delicious treats. Icy is usually picky as well, and she loves these treats so I'll bet your dog will like them too. These sound like great treats. we entered because we're sure our woofie cousin, Bandit, would like them. I'm so glad you entered, thanks! It's so nice of you to think of your woofie cousin, you are such classy ladycats! I give my dog a treat most every day -- but always when I am training him and he does something good! You like to spoil your babies! My dogs get treats most days too. They deserve extra special love don't they? YUM! These look and sound so yummy! I love when a treat is nice and healthy too. Thanks for this review! If my dogs are any indication, they're delicious! I like that there are a lot of healthy ingredients in these treats too. These sound delicious! Of course my kids get treats everyday!! My dogs LOVE them! I give my girls treats nearly every day too, they deserve it! I can't believe you're running how on treats from the conference already, LOL! I got so many, not just from the swag bag but from the vendors too. Icy and Phoebe love Vita Bone treats, especially these new soft treats. I know Ruby would love them too. I admit that I give my dog (and cats) treats *almost* every day. I'm a sucker. What can I say?! Me too, LOL!! I give the dogs treats almost every day, they are SO spoiled, but I love to spoil them. They probably get a treat once a day, but when I am home alone with them, I probably give them a weeks worth just trying to teach them stuff. LOL! When I'm training my dogs they get SO many treats! I need to rein myself in sometimes.